G2PLAY.net is a platform that provides sellers and buyers from all around the world with the possibility to trade digital game keys and in-game items at a fair price with no hassle through an innovative platform. More details can be found here. Do I need to have an account to order a product on G2PLAY.net? Having a registered account is necessary to buy on G2PLAY.net. Once you are logged in, you can choose any product you wish to purchase and just go through our checkout process. In order to register an account on G2PLAY.net, you have to click the Sign up button and enter your email address and password. As an alternative way of signing up, you can use your Facebook, Google+ or LinkedIn account. If you forgot the password to your G2PLAY account, you can press Forgot password and follow the instructions to restore it. How do I sell on G2PLAY.net? If you intend to sell more than several keys at a time, you need to have a merchant account. To become our merchant, fill in this application. Otherwise, our C2C selling feature should be sufficient. For more information scroll down to the C2C section below. Can I create a list of my favorite games? Yes, you can add any specific game offer to your favorites by entering the game's description page. Under the game's price and dedicated Buy button, there is a link to add to favs. Simply click on this link and the game will be added to your list of favorites. You can contact our Customer Support by clicking here. Please avoid creating multiple tickets regarding the same issue, and keep in mind that every message resets the ticket waiting time delaying our response. Therefore, submitting multiple messages without our reply is not recommended, as this will most likely extend response time. My order’s been created. What does its status mean? Pending Payment - Awaiting your payment, can be canceled in My Orders tab. Processing - Is paid and about to be completed. This usually takes up to 15 minutes. Processing:Pre Order - As above, except the order will be completed around the game’s release date, as stated on the product page. On hold - The dispatch has been held. You should find more details in our message - see your tickets in the Customer Support tab. Complete - Order has been processed, and the item is already delivered (or will be shortly - see product description). Closed - Order refunded by an administrator. Canceled - Unpaid order has been canceled. If you were charged, please provide us with at least the transaction ID but preferably all payment details. Suspected Fraud - Mostly associated with incorrect BitPay payments. Contacting our Customer Support highly advised. Payment Review - Either your eCheck is being cleared (5-7 days) or your payment is being verified by PayPal (up to 72hrs). Our Customer Support may certainly clarify that for you here. Banned - Order has been blocked due to safety reasons. Contacting our Customer Support highly advised. Order dispatch shouldn’t take more than 15 minutes after creating an invoice. However, there are many possibilities for a delayed order, ranging from technical issues to security reasons. Regardless, your first step should always be to check the order status and act in accordance with what the aforementioned status says (see the previous question for a more detailed description of each order status). I bought a pre-order. When can I expect my key to be delivered? Please note that since it’s a pre-order, you will receive the product key around the release date, as stated in its description. Also, any bonuses, if included, may differ from offers on other stores. In accordance with our Terms and Conditions, any pre-order can be canceled anytime up to 3 days prior to the date of the game release (unless any activation key associated with the product is released in advance). Refund requests filled within the last 3 days may not be accepted. However, if you have G2PLAY Buyer Protection included in your pre-order, you may cancel it at anytime until the key is delivered. Please just contact us via our ticketing system to make sure we received your request before the dispatch of your pre-order. I lost my internet connection while sending a payment and now my order is Pending Payment. Can I pay for it? Unfortunately, once the payment gateway is closed, there is no way to re-open it, hence the second payment attempt for the same order is impossible. If you haven’t been charged, we suggest canceling such order in the My Orders tab and just placing another one. We accept the most popular payment methods such as PayPal, credit and debit cards, Paysafecard and BoaCompra. We also accept bank transfers and Smart2Pay methods along with ones available locally in specific countries such as DineroMail, Boleto and Gpay. We are continually working on expanding our list of accepted payment methods which can be found on every product page under Show available payment methods and under the link below. Who can see my credit card information? G2PLAY doesn't see or store your credit card information. Only the payment services we use can see your credit card information which is necessary for them to process the payment. All pages where you are required to enter your personal or credit card information are secured. What are G2PLAY Wallet Funds and how do I use them? It’s basically our store credit and works pretty simple. G2PLAY rewards you with €0,01 for every €1 spent here. Gathered funds can be used along with other payment methods to lower the total amount of your order, or cover it entirely. You decide how much of the funds you use by adjusting the slider in your cart. For more information about G2PLAY Wallet Funds, click here. To be up to date with our promotions, please follow us on Facebook and Twitter. After following the abovementioned advice you can rest assured you won’t miss any discount codes or even free games. My key / gift is not working. What should I do? Most importantly, make sure that you’re redeeming the key on a correct platform - checking the name of the product you’ve purchased will help to determine which one is it. Keep in mind that some products can’t be activated on Steam, Origin, Uplay or Battle.net, but on a developer’s own platform - such keys are usually described as Digital Download. Next, make sure that the product description doesn’t mention any restrictions that could affect the activation - regional restrictions or other product limitations are always highlighted in a bold or red font in the product description. If the key’s still not working, please refer to a topic related to specific digital distribution platform in this FAQ section. I bought a voucher. What is that? In this case a voucher may be, for instance, either a 100% discount code for a Ubisoft Store applicable to a specific title, or a GeForce code. Vouchers unlock products on external pages and redirect you to the appropriate platform afterwards. Just make sure you read the product description and the activation details, as vouchers are great, however, the activation process may be unclear. It doesn’t affect your gaming experience nor any other features associated with having the game. You can enjoy your game for a better price and use saved funds for some DLCs to enjoy it even more. Why is my Windows key not working? Please bear in mind that, in most cases, Windows activation problems result from incorrect or faulty system installation. We are aware that this installation procedure might be confusing and that's why we have implemented a new Windows bot which will assist you with the most common issues! You can try it out by visiting our LiveChat and picking Windows - activation issues from the list of topics. Begin by downloading the Windows package. Necessary links for the installation files can be found on the product page in the Activation Details tab. If you have installed the correct Windows version and you are still unable to make use of your license (for example due to an error 0xC004C008), please use the automated phone activation system, as in most cases this method solves the issue. If the problem with your key persists, make sure to contact us via LiveChat and we will do our best to guide you through the activation process. The details of the current version of your system. How long until I receive my product code? We usually send you the product code within 10 minutes of receiving your payment. If it's taking a bit longer, check your order status and act as advised in the 1st question from MY ORDERS - DELIVERY, PAYMENTS, VERIFICATION section. Will the game work on my computer? Always be sure to check the minimum requirements listed on the product's description page and the Activation Details. For any technical problems such as bugs and/or black screens which are not related to the game key itself, please refer to the FAQ on the game developer's website. Game codes: once the code has been delivered there is no return or refund of any kind. That’s why we encourage you to always include G2PLAY Buyer Protection in your purchase, which guarantees you an extended assistance, such as the resale of a no longer wanted product resulting in returning your funds. I need to take screenshots showing a problem with the key I bought. How can I do it? The easiest way to take a screenshot is to press Alt + PrntScn combination on your keyboard in order to copy the currently visible screen to the clipboard. Next, open any image editing software, such as Paint, and press Ctrl + V to paste the captured image. Finally, click on the Save button to save the image in a selected location. My Steam key is not working and I've already tried every solution. What should I do now? 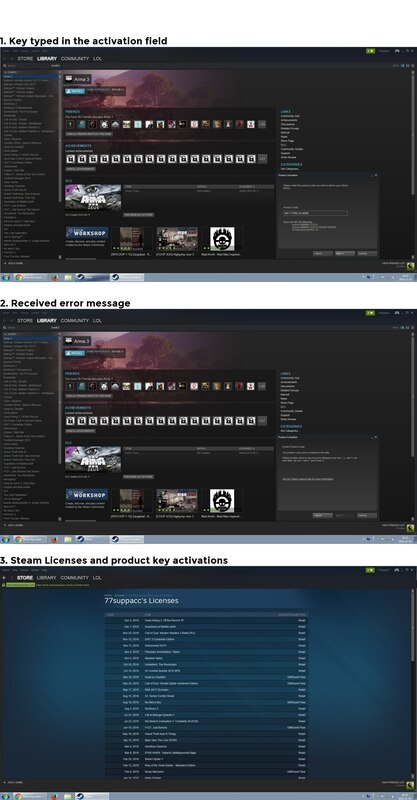 Steam account licenses and product key activations (click on your account name in the top-right corner -> Account Details -> View licenses and product key activations). 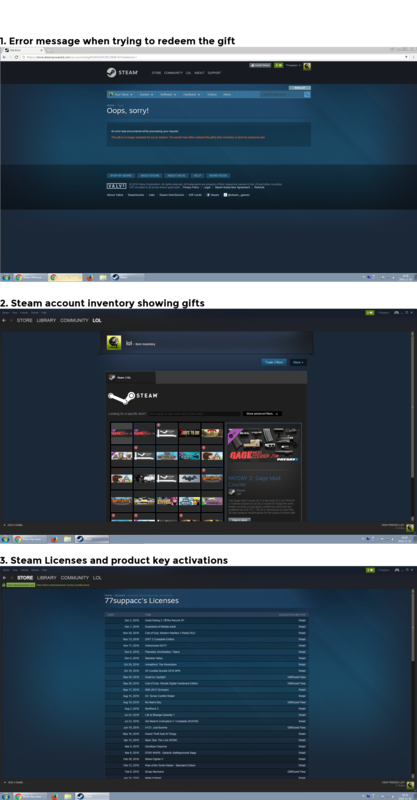 My Steam gift is not working and I've already tried every solution. What should I do? 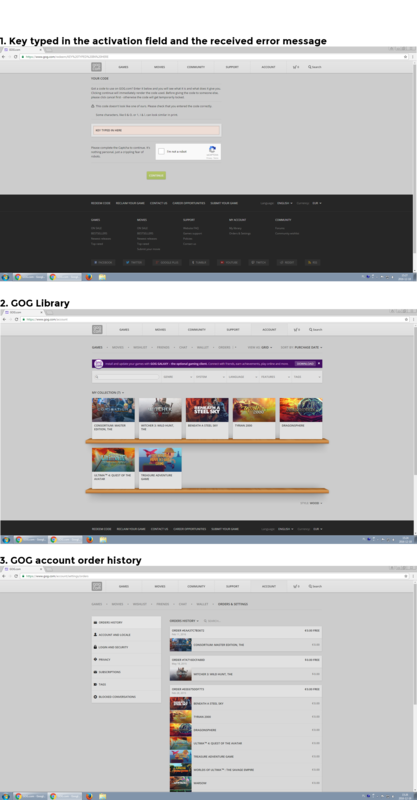 Steam account licenses and product key activations (Licenses and subscriptions - click on your account name in the top right corner -> Account Details -> View licenses and product key activations). 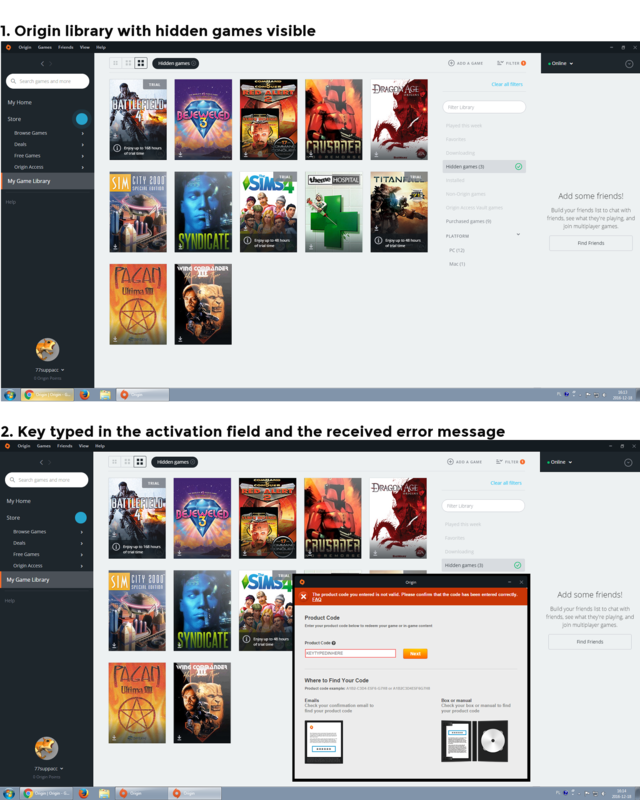 My Origin key is not working and I've already tried every solution. What should I do? 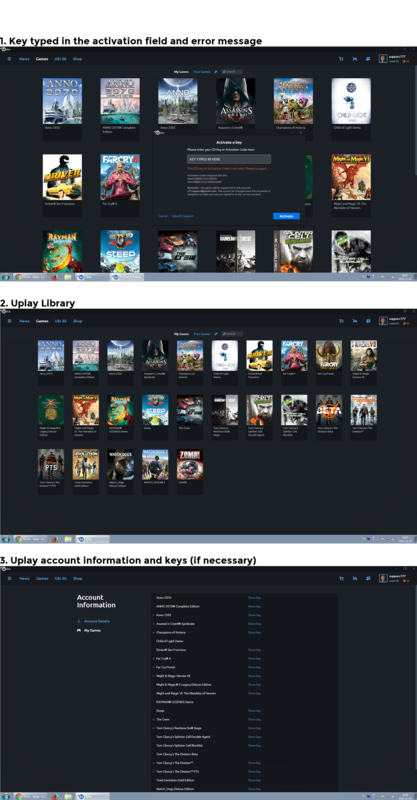 My Uplay key is not working and I've already tried every solution. What should I do? 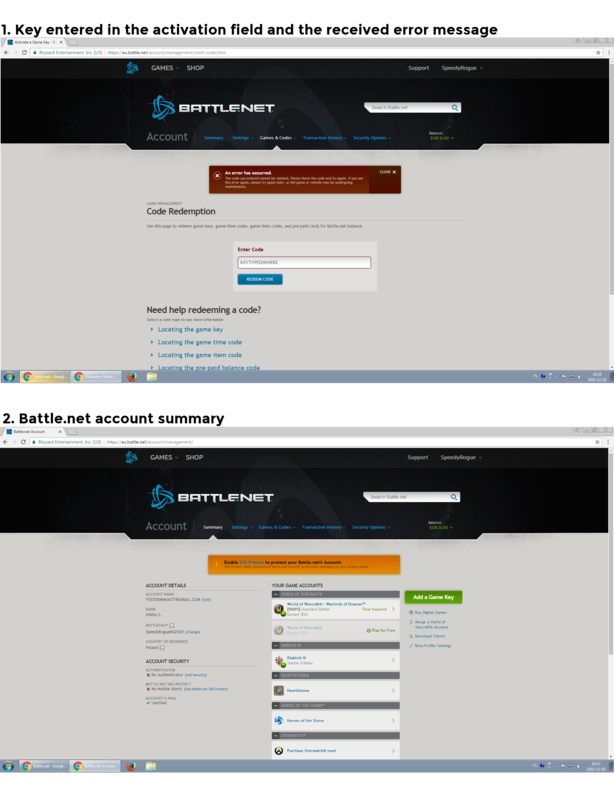 My Battle.net key is not working and I've already tried every solution. What should I do? My Rockstar key is not working and I've already tried every solution. What should I do? My GOG key is not working and I've already tried every solution. What should I do? My XBOX key is not working and I've already tried every solution. What should I do? 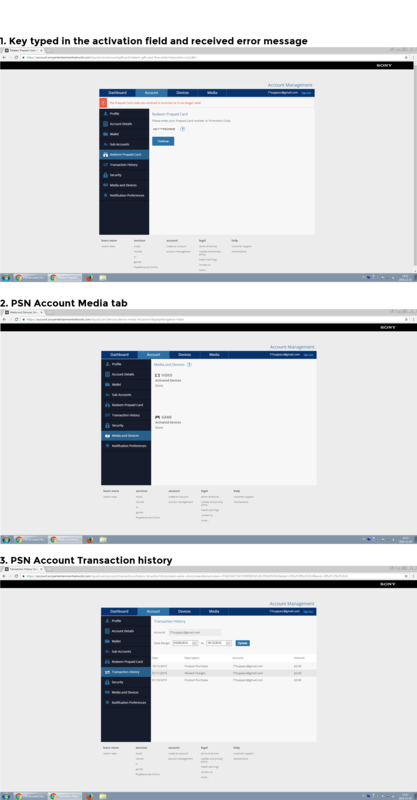 My PSN key is not working and I've already tried every solution. What should I do? C2C stands for Customer To Customer and it’s a feature allowing you to sell a few keys without having to change your account status. More details can be found under this link. How can I withdraw the earned Wallet Funds? Please note that in accordance to our Terms and Conditions, G2PLAY Wallet Funds earned using C2C module cannot be withdrawn. If you intend to create payouts, please consider becoming our merchant. I sold my item / key, but the payment doesn’t reflect in my G2PLAY Wallet. What I need to do? Your funds should be available 7 days after the delivery, unless the customer files a complaint against your key. In such case we'll certainly reach out to you for a solution. Please contact us, if the funds are not available for you after the abovementioned time periods. Why is my offer not visible on the store? Offers on our Marketplace are being created every 10 minutes. Although, in some cases our system requires more than a few minutes to process product creation, thus there might be no display issue but just a small delay. Please check your offers status in the My Offers tab. If it's been disabled by our team - status denied, you should receive a message with more details. If it's active and stil not visible after an hour, please contact us. I sold an item, but the payment doesn’t reflect in my G2PLAY Wallet. What I need to do? In order to receive the funds, the customer has to accept the trade offer, then balance will be added within 5 minutes. If the balance won't show up on your account within 5 days, please contact us. How can I add a product that is not on the list? To add a non-existing product to the list, please go to the Content tab and click on Create a brand new product. After that, click Next and fill out all the necessary fields (most importantly, the noteworthy facts about your new product, such as available languages, bonuses, region limitations, activation details, etc.). 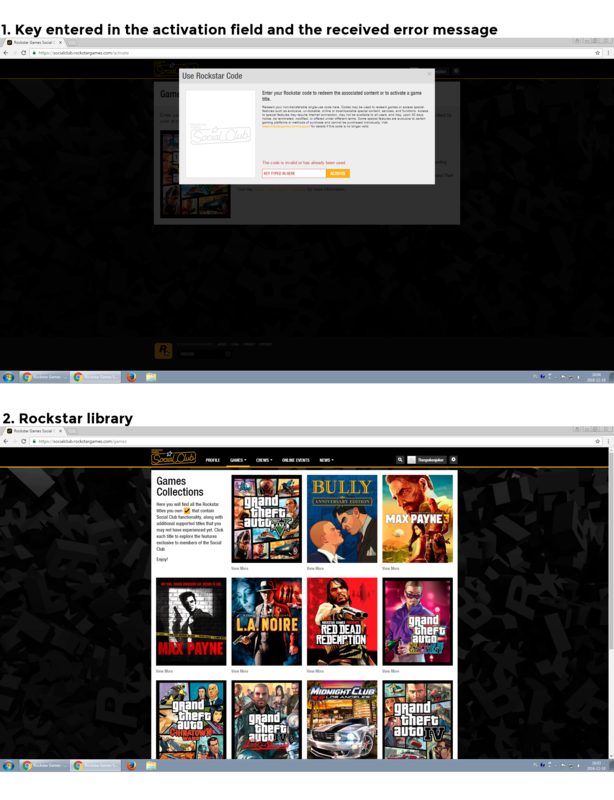 Once you're done, click Continue and then Submit to finish creating the custom offer. Please note that it might take up to 24 hours for the offer to become visible in the store so don't be alarmed if it doesn't show up right away. My product consists of more than one key. Can the keys be sent together? To send two or more keys in one purchase, please make sure to write them in a single line, without separating them with the Enter key or commas. You can separate the keys with a short description for each of them, however, it's not required. How do I sell my products on G2PLAY? Assuming you are already our verified merchant, just click on Create a New Product button. If you’re not, then regular sales on G2PLAY require having a merchant account. You can find more details (incl. commission and fees) and also apply for merchant status under this link. Fill in this application and await our message with further details. In case you don’t want to undergo the merchant verification, we suggest using C2C feature on your profile. However, you may only sell 5 keys at a time. How much information about the product should I include? After you create a brand new product, it will have to be verified by an administrator, which means that you should provide us with as many details as possible prior to its activation. Any mismatched or missing information might cause complaints from the customers and under the circumstances, they will be automatically entitled to at least a partial refund for misleading product description. We would also encourage you to check the product description page of your offer after it has been activated. This will help you avoid any future issues with customers. I've already sold some products but never received any feedback. How come? Each buyer has an option to leave feedback regarding every transaction he or she has made. However, such feedback is not mandatory and is up to the customer's goodwill. In accordance with our Terms and Conditions, the payment for a sale of a product will be forwarded to your G2PLAY Wallet Funds after 30 days pass from the date of the transaction. Once the money is available in your G2PLAY Wallet, you can request a withdrawal in the system. Payouts can be created here. Payouts are usually done once a week and only in Euros. Payouts can be issued via: PayPal, Skrill or sent as a bank transfer. Please note that the minimum payout amount for PayPal, Skrill is €80, whereas for a bank transfer it’s €100. More details here. How and when will my products be delivered to the buyer? All orders are verified and processed 24/7 by our dedicated support team so there is no need for you to worry about sending your products to the buyer. All you need to do is create an offer and add your keys or items to it. Products are usually sent within 10 minutes of us receiving the payment from the buyer. Due to some fraud risk, some orders may take even up to a few days to be processed, depending on the cooperation of the customer. This, however, only happens in very rare and extreme circumstances. Why is my offer not displayed on the store? Our system sometimes requires more than a few minutes to process product creation, thus there might be no display issue but just a small delay. Please check your offers status in the Content tab. If it's been disabled by our team - status denied, you should receive a message with more details. If it's active and stil not visible after an hour, please contact us. Is it possible to pay for games with my G2PLAY Wallet Funds? Yes, it's possible. All of the money which is available for withdrawal can also be used to purchase new games on G2PLAY.net. Let us know and help G2PLAY creating the best FAQ page for you!